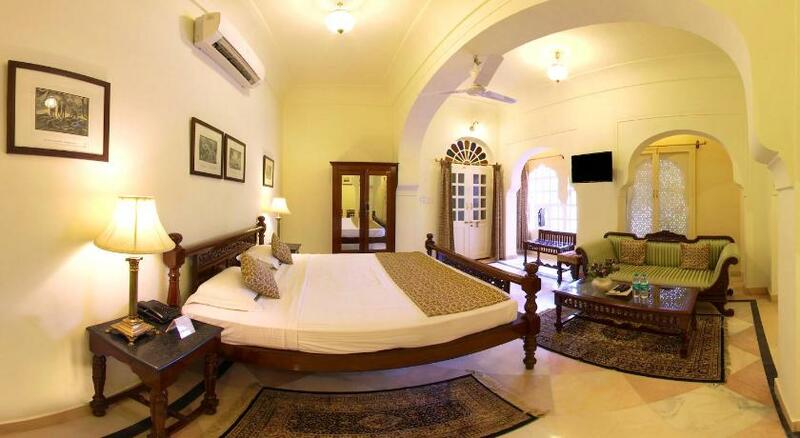 This heritage hotel was once a large ‘haveli’ (traditional home) for a large Indian family. 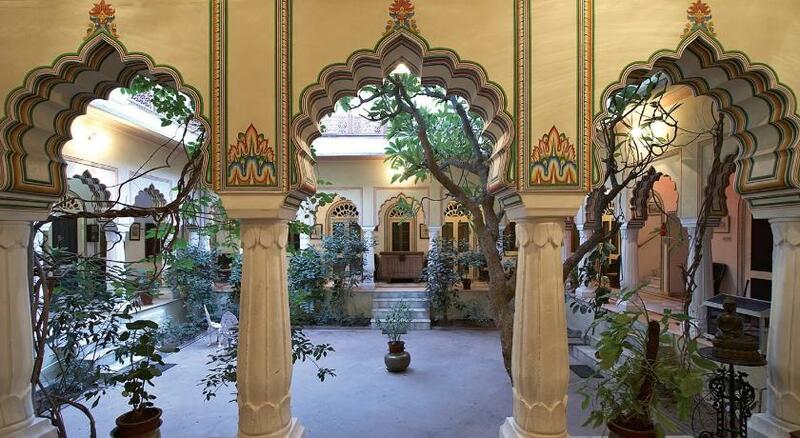 It has a welcoming and rather dramatic façade, open courtyards, a swimming pool, and a boutique that sells block-print clothes. 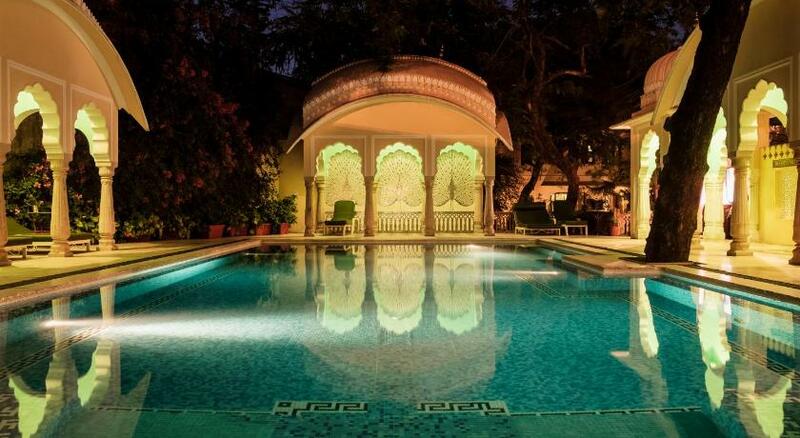 Jaipur is a city of distinct neighbourhoods – this heritage hotel is near the Old City. 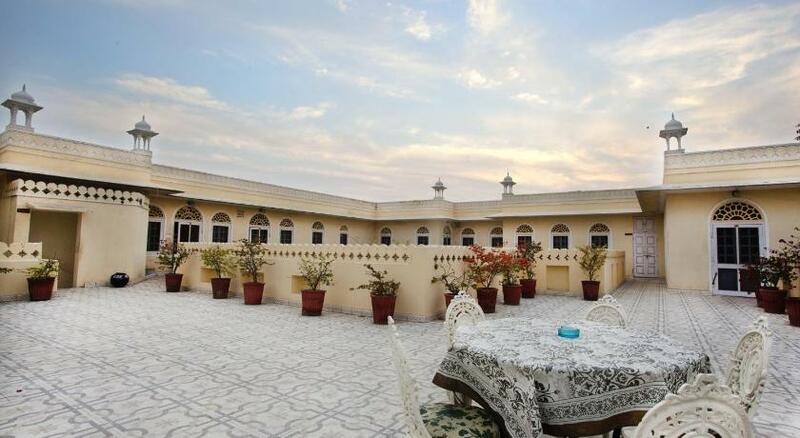 If you are in town to shop for handicrafts, textiles and handmade puppets, Alsisar Haveli is a terrific base – it’s 10 minutes away by car from the Pink City, with its roads named after Bagru block printers and other artisanal guilds. 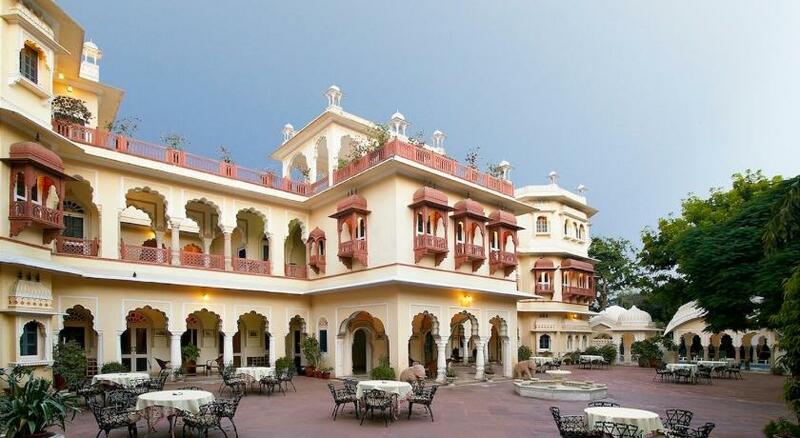 The much-photographed Hawa Mahal, or ‘Palace of the Breeze, is 15 minutes away by car. 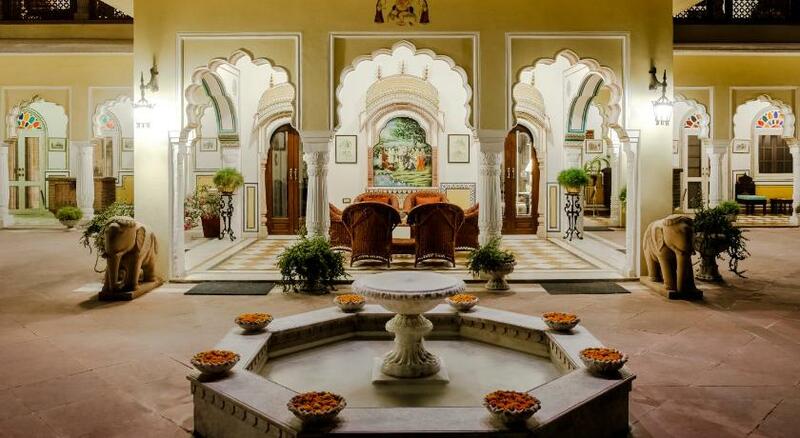 The lobby, with its large copper pots and royal regalia, leads to a spacious sunny courtyard, the heart of the hotel. 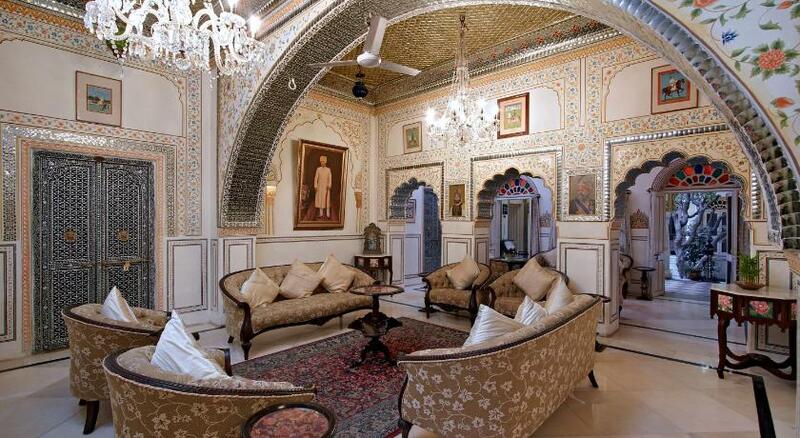 The frescoes drawn at the entrance porch are taken from the Shekhawati region where the owners come from. Within is a rabbit warren of corridors, stairs, courtyards and rooms adorned with brass door handles, stained glass windows, and painted courtyards. Those who have trouble climbing stairs ought to choose ground-floor rooms since there are no lifts in the property. 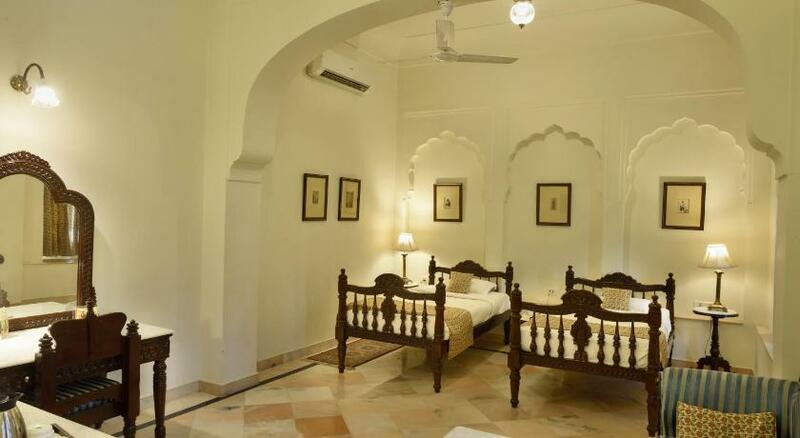 Two rooms serve as an ayurvedic spa. 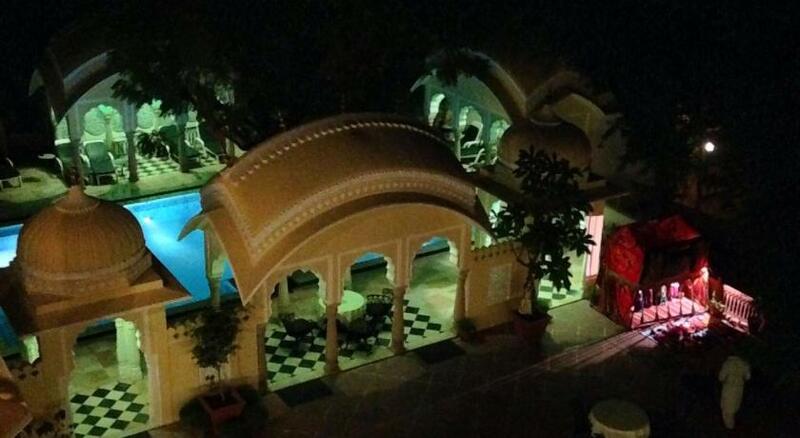 The swimming pool adjoining the courtyard is decorated with local tiles designed to look like silver peacocks. 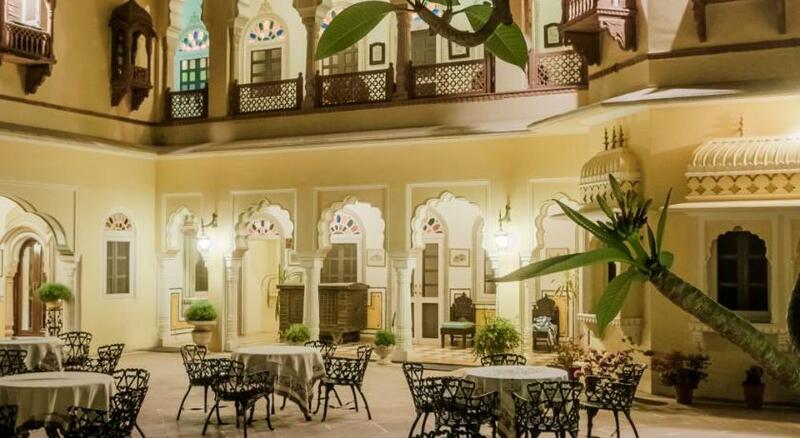 The boutique, Tokree, run by the owner’s daughter-in-law, has well-curated and well-priced clothes that have a Rajasthani touch—think muted green and gray. The staff don’t fuss over you but take care of requests with a smile. They are around but not in your face. 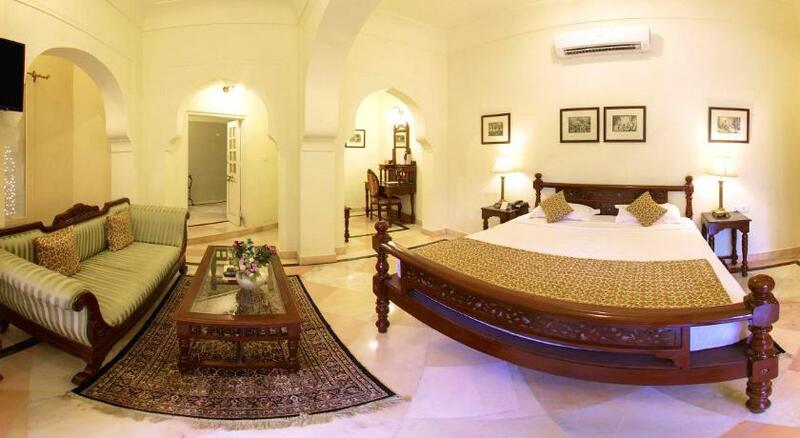 The larger rooms upstairs have mahogany four-poster beds, a wooden writing desk and spacious bathrooms. 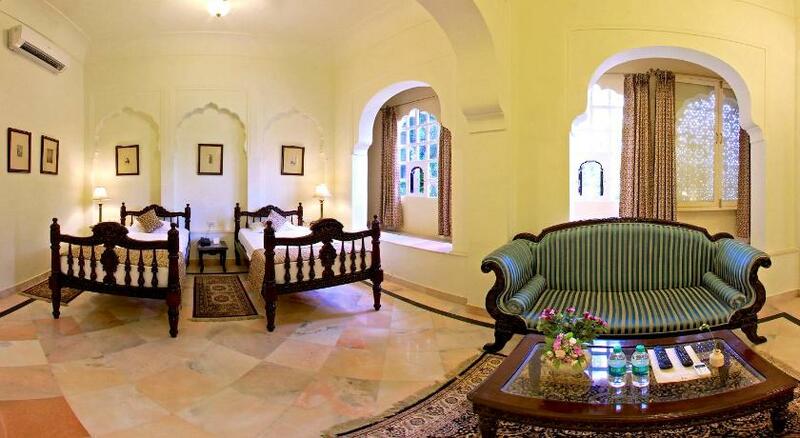 The block-print furnishings are typical of Rajasthan. 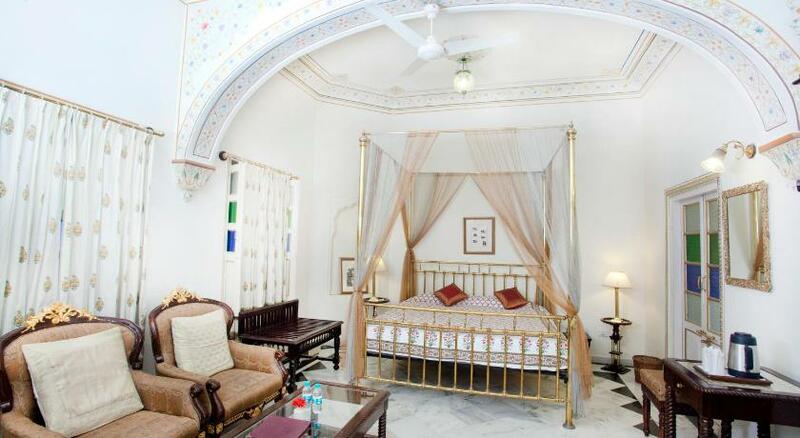 The best part of the rooms are the painted ceilings which look magical with their yellow, turquoise and green borders. Portraits of the owners and their children in every room offer glimpses into their lives, an intimate view into Indian family life for international tourists. A single restaurant serves all meals, which, while tasty, are not distinguishable from any of the restaurants in the city. 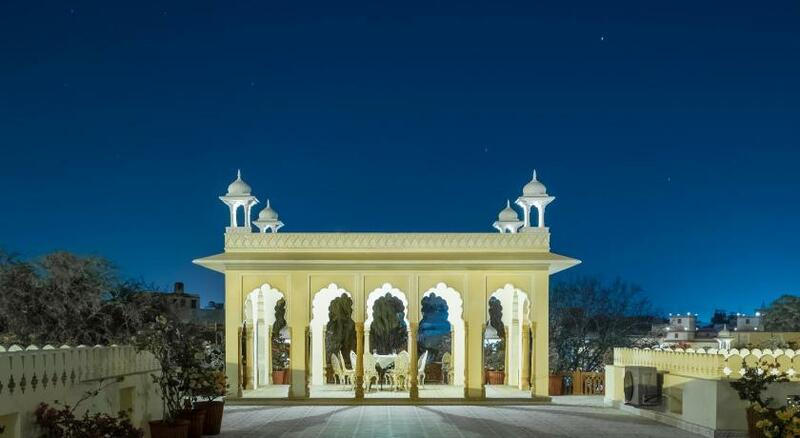 The food is mostly Indian, and specifically North Indian with chicken, lamb, lentil-dals, vegetable curries, roti-flatbreads, and sticky Indian desserts. 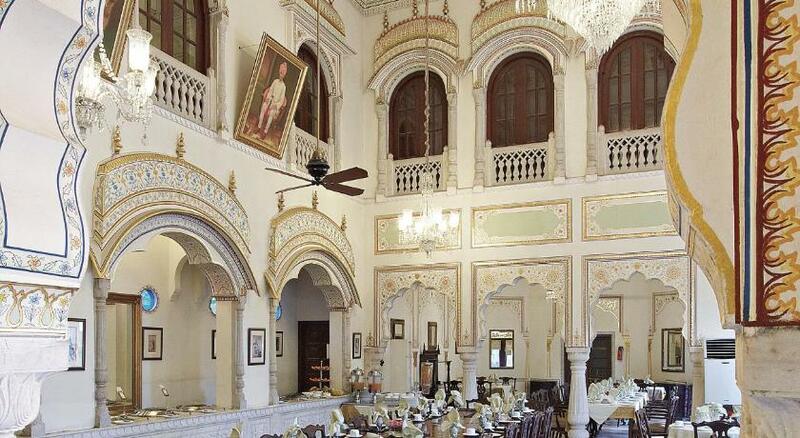 The dining room, with its high ceiling and mezzanine-level doors, looks like a durbar hall. 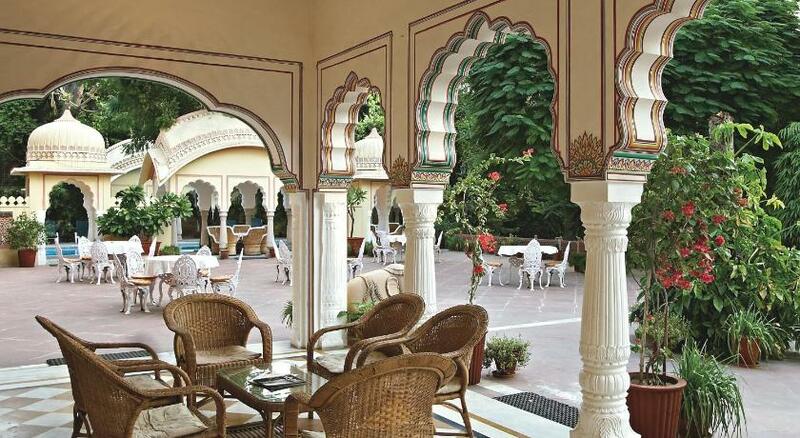 The breakfast buffet includes made-to-order eggs, baked beans, bread, fruits, and Indian dishes such as spicy parathas with yogurt and pickle. Double rooms from INR 4545 (£54) in low season (March to September); and from INR 7140 (£85) in high (October to February), exclusive of taxes (28 per cent). Breakfast is usually included. Free Wi-Fi. The hotel has ramps and lifts. There is one room adapted for guests with disabilities. Babysitters can be arranged, but beyond a library, there isn’t anything specific for young guests. Sansar Chandra Road, Jaipur 302 001, India.